The club reached a new milestone today as Colemanstown fielded an underage girls team for the very first time in the clubs history. The girls aged 8 to 11 participated in a blitz hosted by Colemanstown in which Colga, Cregmore & Colemanstown took part. This was a follow on to the successful pre-Christmas Soccer Sisters Programme which was run over a 6 week period in the lead up to Christmas. The girls certainly showed that there is promise for ladies soccer in the years to come with some decent performances by all players involved. The girls acquitted themselves so well on the field of play that the visiting coaches could scarcely believe that these girls have only been playing soccer for 2 months. The squad pictured below who entered our history books today were: Back Row L-R: Zoe Kennedy, Mentor; Della Griffin, Aoibheann Moore; Honor Tuohy, Niamh Kennedy, Lilly Blade, Aoife Scarry, Elaine Walsh, Mentor; Front Row L-R: Grace Mitchell, Libby Kennedy, Lily King, Aoife Walsh, Rachel Kennedy, Ruby Lynch. 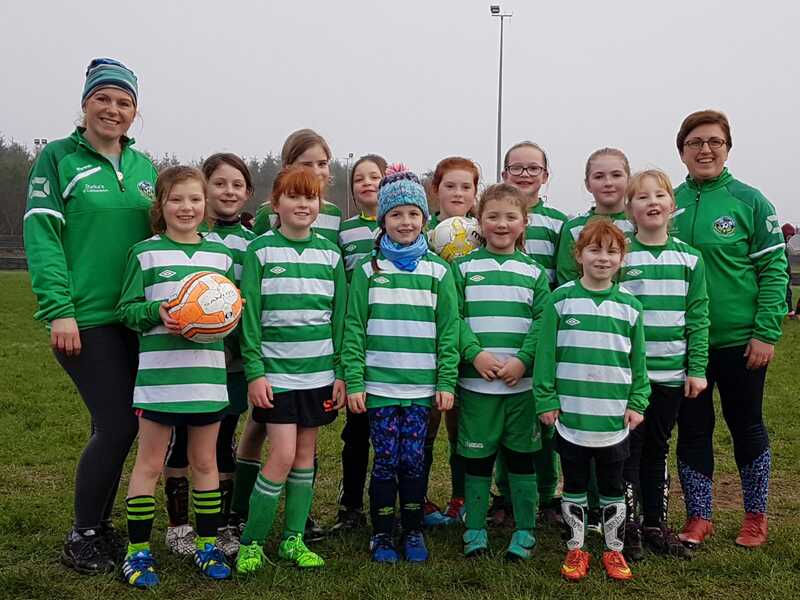 This very first girls team were managed by Elaine Walsh & Zoe Kennedy who took the mantle with great confidence and even had time to offer some great hospitality with a welcome cup of tea on a cold hardy morning as Alisha McNamara kept things moving in the kitchen. The ladies also served up some of their scrumptious home baking which went down a treat with all present. The ladies together with Robbie Parker who also kept a watchful eye on proceedings today continue to drive girls soccer within the club. They will no doubt turn today’s milestone into large stepping stones for even more milestones and achievements for these young girls and further build girls and ladies soccer within the club. It was a proud day for all involved in the club. Well done as we look forward to watching this talented bunch grow in confidence, character and cognition as they express themselves on the field of play.